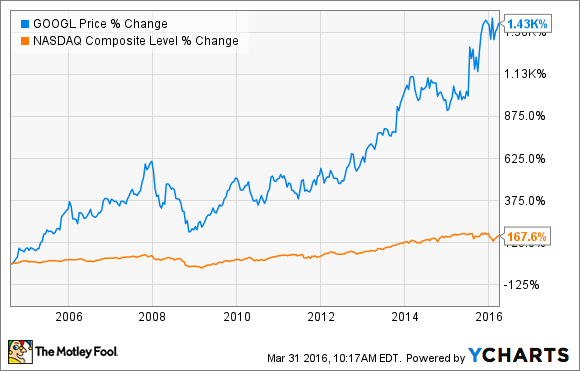 Nest's Problems Point to a Broader Lesson for Alphabet Inc. Revelations about cultural and financial issues within the smart-home device maker show that even with the Google parent backing them, "moon shots" are never guaranteed. As the saying goes, not all that glitters is gold, a maxim Alphabet (NASDAQ:GOOG) (NASDAQ:GOOGL) would do well to remember. To be sure, Alphabet, formerly Google, has built one of the most dominant franchises in technology today, perhaps ever, and the returns to shareholders have since its 2005 IPO have been equally impressive. However, Google's 2015 reorganization into the holding company Alphabet signaled a change in the company's long-term strategy, one under which growth is predicated not just on the continued dominance of its search business, but also on the success of its multifaceted moonshots. However, as recent news reflects, it's far from certain how much success Alphabet can expect from its so-called "Other Bets" -- the catch-all reporting term Alphabet uses for its collection of high-potential start-ups. In late March, an article published by The Information detailed the current messy state of affairs at Alphabet's Nest subsidiary, which Alphabet acquired for a stunning $3.2 billion in January 2014 . Though the long-form piece details the troubles at Nest in great detail, the firm's purported problems can be distilled down to a single, pervasive issue: Nest CEO Tony Fadell. Much of the article focuses on the internal turmoil that resulted from Nest's acquisition of security camera start-up Dropcam for $555 million in June 2014. According to the reporting, the Dropcam merger and its integration into Nest's long-term business plan devolved into a protracted affair that exposed broader issues with Fadell's combative managerial style. Reminiscent of the one-time tyrannical management style of Steve Jobs, under whom Fadell rose to fame by leading the division that developed the iPod, The Information's article portrays a business hijacked by its founder's detailed, but ultimately detrimental, whims. Fadell reportedly filp-flopped on key strategic planning decisions and, in some interviewees' opinions, unnecessarily labored over adding new features and improving product designs to the point of inertia. Unfortunately for Alphabet investors, revelations about this turmoil come at a time when the parent company is putting greater pressure on subsidiaries like Nest to begin to deliver tangible results, rather than operate on promise alone. The publication of the Nest exposé comes at a time of greater conflict at two more Other Bets. Reports of similar culture clashes at Boston Dynamics, a robotics firm, and Verily, Alphabet's life sciences start-up, have also surfaced in recent weeks. According to Fadell, "The fiscal discipline era has now descended upon everything." From an investor's perspective though, this should seem like welcome news, since it appears Nest could use a hefty dose of discipline, managerial and otherwise. Nest reportedly badly missed its 2014 sales targets, and it has yet to launch a new piece of hardware since its 2014 acquisition, though the company claims it has plans to. More broadly though, this tension speaks to the challenges and headaches that Alphabet investors will have to endure as the parent company attempts to nurture its start-ups into viable, going concerns in their own rights. The evolutionary process there -- as it is for all businesses -- is clearly messy. And costly: Alphabet's fiscal 2015, the first year in which it detailed Other Bets' performance, saw the eight start-up segment produce a $3.5 billion operating loss on revenue of $448 million. Such a state of affairs, though typical of high growth start-ups, cannot continue indefinitely. Most importantly, the tensions at Boston Dynamics, Verily, and now Nest should serve as cautionary tales to remind investors that many, if not all, of Alphabet's Other Bets may not pan out as hoped. This could leave Alphabet shareholders footing the bill for the equivalent of several very large and very messy science experiments, with little to show for it.